For a society that was meant to be a paperless society after the invention of computers, there sure are a lot of papers we need to keep. But which financial records are necessary to hang on to and when can you get rid of them? How long should you keep pay stubs? What records are essential to keep? How do you ensure no one steals your identity when you do throw records out? Keep reading to learn the answers to these questions and more. We’ll talk about pay stubs, financial records, and keeping yourself financially safe. You don’t have to become a compulsive hoarder and keep your paystubs for decades. You don’t want to toss them right away either. 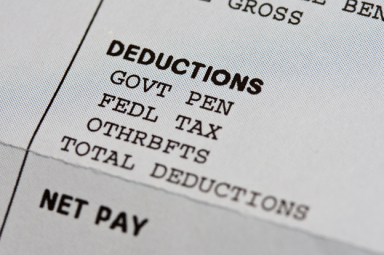 The general rule is to keep your pay stub for a year, or at least until your taxes have been assessed. You’ll need to make sure that everything is in order and to verify that the W2 you receive is accurate. If you get paid through direct deposit and don’t get a paper paystub you can always use a check stub maker. If you own your own business or are self-employed you’ll want to keep records for seven years. To be on the safe side in case the IRS decides to do an audit. The government can request records for the past seven years. Medical expenses, business expenses, charitable donations should all be kept for seven years. This is in case you need to verify the deduction with the government. What Else Should You Keep for a Year? Pay stubs are not the only thing you’ll want to hold on to for up to a year. All investment statements, canceled checks, and medical costs you’ll want at tax time. If you’re nervous about getting rid of them after your taxes are assessed you can scan them. This way you have an electronic copy. What Can You Throw Away After a Month? Receipts for purchases with debit cards, credit or ATM transactions are smart to keep. for at least a month. This way you can verify them on your bank or credit card monthly statement. If there’s any discrepancy you’ll have the original to straighten out the problem. After you verify it on your monthly statements you can throw out the individual receipts. You’ll have the monthly statement for a record of all those transactions. What Should You Keep Forever? Most of these transactions will be relevant for decades. Which makes sense since the payments span over decades. Any purchases that are major investments should have proper paper documentation. You’ll want to keep the original signatures. You may think that keeping a computer copy is enough but you never know when your computer may crash. You could get hacked. Or it may not be considered proper documentation if a legal issue should arise. Now we’ve answered the question ‘how long should you keep pay stubs’, here’s an important follow-up: Don’t throw any documents away containing personal information without shredding it. As many as 9 million Americans have their identity stolen each year. You don’t want to be one of them. If you’re looking to improve your economic situation check out our post on how to save money on finance costs or any of our other great posts.